Looking for the top Annapolis kitchen remodeling technicians? Call Heidler, Inc. at (410) 268-7191 to start planning with one of our experts today. Check out our latest specials here. Remodeling your kitchen is more than just making cosmetic changes. You also have to consider the plumbing, which will need to match the new location of the fixtures. 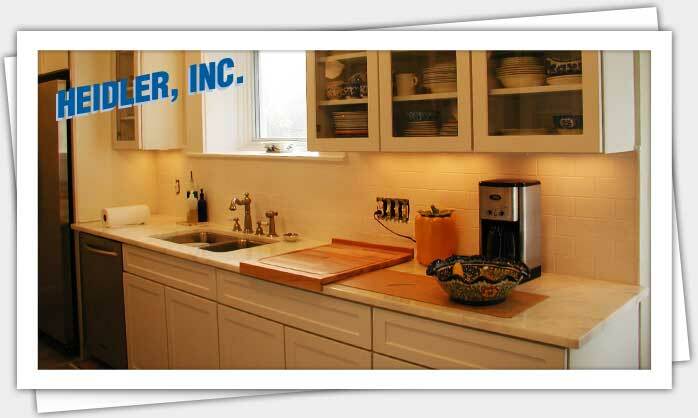 For stress-free solutions, contact your Annapolis kitchen remodeling experts at Heidler, Inc.
We have been helping the neighborhood since 1947. Click here to read our latest customer reviews. How does the current layout of your kitchen fit into your plans? Your goal is to have a great looking kitchen. Our goal is to make sure the final result meets your daily needs in terms of properly installed plumbing lines and fixtures. Before remodeling your kitchen, we will take your current layout and functionality into consideration. This means our remodeling services work around your existing plumbing connections to serve as a guideline for your new design. This includes selecting fixtures and materials that are durable and versatile. One of the most popular materials used is satin nickel because it requires little maintenance (easy to clean and shows less water spots), is versatile, and has a chic, modern look. Thinking of upgrading your faucets? Your kitchen is one of the perfect breeding grounds for germs. For greater efficiency in tasks such as rinsing vegetables, fruits, and meat, consider connecting touch-less control faucets to your existing plumbing to create a more sanitary space. As part of the remodeling process, we also ensure that any water lines connected to appliances and fixtures are properly installed and working efficiently. This includes water lines to your sink, as well as your refrigerator’s ice and water dispenser and your dishwasher. Looking to install a more modern sink? If you have a large family or love to host get-togethers at your home, we recommend adding a second sink to your kitchen if space allows. A sink upgrade gives you the convenience of having more than one person prepping and cooking meals, with less work involved. To achieve your new sink installation project, call us for a professional solution. We will relocate all necessary pipes to make sure you are getting the water you need from your sink without hassle. Plumbing factors, such as the ones mentioned above, do not have to create limitations when you decide to remodel your kitchen. By working closely with us, you can have the kitchen that fits your lifestyle and design preferences. Leave the rest of the work to us. We will handle all plumbing considerations, making sure your kitchen meets local plumbing codes. You can also rest assured that all water lines will be properly connected to your appliances. Are you ready to remodel your Annapolis kitchen? Give us a call at (410) 268-7191 to discuss your options today. You will receive guaranteed flat rates and quality results.